SAFFRON : Pascual Reverte S.L. The name of Saffron comes from the Arabic name of sáfaran, meaning “be yellow”. It’s cultivation was introduced in Spain by the Arabs. The lands of La Mancha, Aragon and Levante (Murcia and Valencia) at its peaks, was considered the best saffron in the world because at it's flavour and colouring power. Saffron is a spice from the dry stigmas of the Crocus Sativus L. Each flower has three stigmas, intense red colour: the saffron threads. 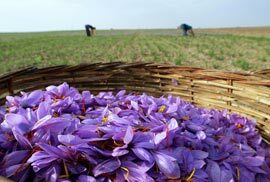 Saffron cultivation requires some special climatic conditions, dry hot summers and cold winters, there is little need for rain. Once picked, the stigmas are removed and dried. All the process is carried out manually. The saffron is mostly used for flavouring and colouring dishes. It transmits a yellow colour. The food industry knows that the properties of saffron, give colour, flavor, and aroma to many of their culinary preparations. In powder or in threads saffron is an ingredient of value and personality. In Spain saffron is essential in preparing dishes like Paella, La Fabada Asturiana, El Caldero del Mar Menor or Fideuá. In France for French fish soup; in Sweden the day of Santa Lucia it is customary to make bread with saffron. In northern Italy and southern Switzerland to prepare the Risotto. In India in rice and ice cream. Due to the hand-harvesting of the saffron flowers this is the most expensive spice in the world, but we not only recommend it for the delicate aroma it adds to rice and pasta dishes, soups, meat and fish. But also because it's used in very minuscule quantities it make the cost irrelevant. We recommend saffron powder to obtain the best results (more flavour and more colourant power).